Water, together with Wind, Earth and Fire is one of the four known basic Elements, which represent the substance of the world - at least this is the common belief among many races and tribes throughout Caelereth. Water in its physical form is needed to live as one must drink or absorb in a way some form of it, as life - be it plant, animal or sentient life - seems to depend to a large degree on this eement in order to survive. Water is often associated with emotions, art, time and especially healing and philosophy. It has the depth of a philosophers soul and is the inspiration of the artist, but that makes them just depending on its unpredictable nature. Water gives much, but takes as easy everything back. And more. An old Santharian proverb says that he who gets everything from the Water Goddess will lose everything to her again. Image description. Water masses tossing down at the impressive Torán's Falls near the Manthrian village Nepris. Picture by Nalfaren. Appearance. Water is, while Earth is solid, Air/Wind gas and Fire the changeover between them, liquid. Its the most common liquid matter and therefore most people believe it to also represent the mother of all liquid matters. Therefore it can be said that Baveras didn't only create the water, but also blood and milk and everything liquor. Water is often also interpreted as the purest form of liquid, as the "primal liquid", which only appears in different shapes and forms, but in its transformation always retains its basic elemental properties. In its natural state Water can be found salty (undrinkable for most races) or fresh (the form most plants, animals and races require it). Fresh water is found in wells or in rivers. Salt water is mostly found on seas, wide open spaces filled with Water, too big you can't see land at the other side - on these gigantic seas of the world of Caelereth all the landmasses float. Water is an unpredictable element, because it is so variable. It can cause death and destruction upon those living near open Water, but it also grants life - at humanoids for example it first appears in the form of the sperm, later it helps to maintain important body functions. Physical Water. Water is in physical form one of the things you need to survive. It's something you quickly have enough of, or too less of. Water can only be trusted in small proportions, in wells or fountains. And even then it is a mysterious element, because it can disappear in no time on a hot day in front of your eyes. Nobody knows for sure where it has gone to if that happens, but it is a thought by the elves that the Wind takes the Water back (as the elves believe that Water originated from Wind) to carry it along if the Fire gets too dominant. The heat of the Fire seems to represent the natural elemental enemy of the Water - but also vice versa - Water can extinguish Fire, Fire can make Water evaporate. Water has many properties which especially the Avennorian people have learned to admire, but they also fear it. Water can carry boats to distant lands, and Water in wide open spaces, the body of Baveras, provides also food in the form of fish. But be careful - a legend tells that everyone who fishes on the sea more than it is due is said to that he will be taken by the sea like one takes the fish out of the sea. Water can be very destructive, as it can overflow, taking things with it if the flood ends. It is an element with two faces the Gods send to us down from the skies in the form of rain. Your crops need it, but if they get too much they will die because of it, and so will you. Picture description. 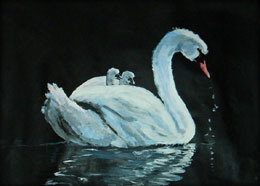 The tranquility of the Element of Water often inspires artists to reflect. Image by Coren FrozenZephyr. Spiritual Water. Water stands, like Fire, for deep, but also for variable, or - expressed in a positive way - "open" emotions, for the acceptance of diversity and the will for the new. Water also represents the contemplative moment, the searching in your inner self, for the discovering of the deepest and darkest things of yourself but also for unleashed chaos, for uncertainty without a goal. Water, in opposition to the stability of Earth, stands for inspiration, for creation, for giving birth to ideas, longings and hopes, for moving and for changing. Because if Water stands still, it will rot, just like things made of derivates of the Element of Earth. But the flowing and the constant re-arrangement as well as the inherent desire to increase, to overflow, to pave the way of the unknown, are also the Water's strength. Water is the first idea to get started, reaching for a goal, where Fire is the actual real first step towards achieving these ideas. It is not incidentally that many a culture in Caelereth sees the Water as the source of all. Water means surviving or not surviving, life or death. 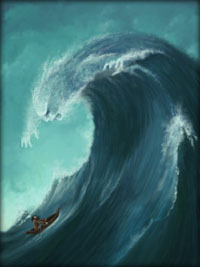 Water stands for the influences of the moon on Caelereth (supposed to control the tide through still disputed magical means) and mysteries. Water stands for freedom and independence. Water is creation and destruction of prior things, care and wisdom, but also tranquility and healing to restore what was once lost. 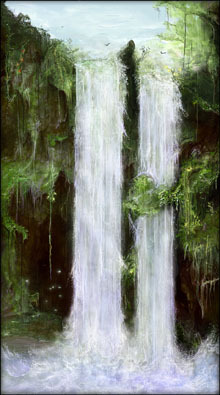 The Element of Water stands for cleanness and pureness, for innocence and virginity. Water is the force which changes people, minds, time and everything, as Water itself is constantly changing, but always the same, a constant pulse of life. Where Fire transforms, Water is the element which demands to be transformed and is transformed itself. Symbols of Water. To represent Water alchemists often use the sign of a drop or the wave, depending on how the element is used in an alchemistical formula. Art also is said to need Water for inspiration, and is therefore dedicated to this element. The most common natural representations of Water are the rain and the sea. Picture description. The destructive nature of a Water Elemental. Image by Quellion. Blue, purple and white are the colours of the Water. The circle, a symbol of Baveras, the Santharian Goddess of the Sea, is also a symbol of the Water in general, probably because it is shapeless, but has the will to spread in all directions. The mythological beast of the Water is the sea-horse or the fish horse. It is a fine representation of the double meaning of Water. It can be a sign for fishers of a clean, fertile and pure sea, but it can also mean that there is a heavy storm approaching. Religious Meanings of Water. As all elements, Water is represented by three gods in common Santharian religion; Baveras, Goddess of the Sea, Jeyriall, Goddess of the Harvest and Seyella, Goddess of Destiny. Note that they are all goddesses, where the Element of Fire is represented only by male gods. Seyella, the Goddess of Destiny, shows her followers the future, as she represents the transparency of time. Priests of Seyella spend their days trying to understand their future, which is shown by Seyella, and fulfill their destiny according to the Gods' intent. Followers of Seyella are rare, but people go to them if they are seeking advice in a difficult situation, wisdom or knowledge. Seyella's Water is the Water of a river, flowing like time. She is also represented by the deepest and darkest caves of the oceans, showing the depth of her thoughts and so the infinite knowledge of creation. Seyella represents the profoundness, the flowing and the clearness in the Element of Water. Jeyriall, the Goddess of the Harvest, is the Goddess who gives life to the beings and teaches her followers to be as generous as she is and respect and love all life. Jeyriall stands for pureness and the life she provides or restores. The Water associated with Jeyriall is mostly the Water inlands, the lakes and the oases, in regions where Water is scarce. Jeyriall's Water never shows the destructive force, as she only deals with the positive side of the element. Reproduction, existence and continued existence in the sense of healing and growth are her main goals. Followers of the Goddess of Harvest are mostly seen as healers and midwives, but they don't have the ability of clairvoyance and neither do they travel a lot. They mostly stay their whole lives in one village, are well respected and provide security to such small communities. They are as down-to-earth as the Fruitful Goddess is, spending their everyday lives mostly as farmers. Baveras, the Goddess of the Sea, has many faces - she is the wild and untamed Goddess, but also the playful, caring one and the one that reminds people of the constant change of things. Baveras stands for moving and changing, and so do her followers, the Baveras' Wills, wander around - healing, finding Water sources and holy places. Baveras is the unpredictable, the variable part of the Water. She is the one that grants artists their inspiration and their courage to literally sail to new shores with their works. Baveras creates, she destroys and she teaches her followers to give something back for everything that is given to them. Myth/Lore. The Element of Water plays an important role in many religions, be it the Caelerethian North, where the land is dominated by ice, or deep down in the deserts of Aeruillin, where Water is seen as a sacred good and an oasis a gift by the Gods. Cárpa’dosía, Of the Elements. II, 15. And so it happened, namely that from the First Hour in the Dream of Avá, in the realm of the Wind and the Earth, the Fire, só Efér, and the Water, sá Már, seized dominion as the forces of the In-Between, in the midst of the soughing of the Winds and the perseverance of the Earth. It is incumbent on those Elements to maintain the equilibrum, as in reality the Becoming is lacking the simplicity of the Spherical, as the Thoughts of the One and All are dispersed too much in its earthen existence. Hence the strife of the Aér'ai'chanía [the Elements] commenced in the very First Hour, the fundamental stife versus the own counterpart, the strife, whose fate it is, never to cease. The Axhái hence named the world S'O'kroí ["Everlasting War"], according to the everlasting strife, and S'O'kroí is meant to mean both: the woes and the conflict, and both is part of the world, and both is one. It is interesting to note that in the Cárpa'dosía the races are also directly related to the origin of the races. According to the elven myth the races were formed by the Gods (who themselves sprung from the thoughts of the High Goddess Avá), and with the Element of Water the Gods formed the race of men, which they named as a specification of the world's conflict "mé'kroía" ("war in vain"). This also indicates very clearly on how the elves see the human role in the world's gigantic play, as - along with the fire-race, the orcs - one of the key races, executing the endless war between the floating ideas of the Wind (elves) and the numbness and invariability of Earth (dwarves). In their origin to the insecure and still constantly expanding Element of Water the elves also see the main reason for the humans' short lifetime. Man is seen as a fleeting vehicle of transgression into the new, forming and re-forming the world, and in doing so he maintains the world's essence, just like the blood in the veins maintains the body's functions. It's also interesting to note that in elven mythology Water is seen as a female power (sá már), in opposition to the male counterpart, Fire (só efér). This also reflects in the fact the Gods related to the Element of Water are all female, while the Fire Gods are all male.